You have been writing for the3rdimagazine regularly for over a year now and I know that you blog. Is this the first book you have written? Yes, I’ve been writing for the 3rdi for well over a year now which followed on from starting-up a blog when I moved to Palestine for few months. I have always focused my writing efforts towards socio-political type stuff and decided to try my hand at creative writing in the form of a children’s book. I go between claiming that “it’s the first of many” and the “it’s the first and last” depending on my positivity levels. Reading for pleasure is imperative in developing a child’s social behaviour. Too many children are spending too much time glued to screens; whether it be watching TV, playing computer games or even texting on a mobile phone. I think it’s important to encourage children to read for enjoyment and my way of doing this is through writing and publishing a book aimed at inspiring the imagination of as many children as I can get it across to. Can you tell us a little bit about the book? What age group does it cover? Is it illustrated and if so, by whom? 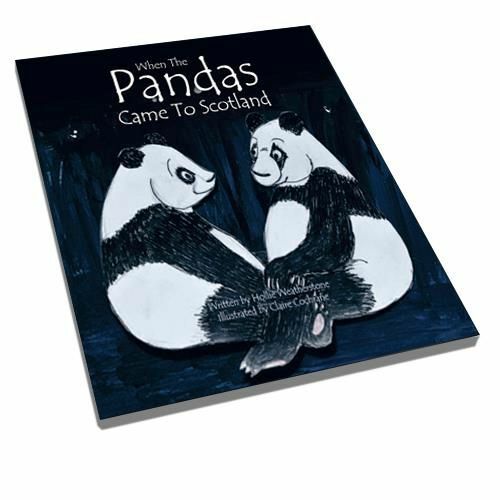 This is the story of the two pandas-Sweetie and Sunshine and their journey all the way from China to Edinburgh Zoo in Scotland. We follow them through the excitement and nerves of moving away from home; leaving friends and family behind, eating bamboo, flying like birds in an aeroplane, eating more bamboo, making new friends and even becoming local celebrities! The book is aimed at 3-8 years olds (aged 3-5 having it read to them and 6-8 reading it themselves). It was illustrated by the very talented Claire Cochrane who is mother to one of my very close friends. We decided to go for a edgy cut-out look similar to that of ‘The Very Hungry Caterpillar or ‘Elmer the Patchwork Elephant’’ as Claire thinks it important to encourage children to be freer with their drawing, as she often finds in her line of work that children become too focused on ‘colouring within the lines’ and ‘being neat’ and thus the creative objective of art is lost via the pedantic means taken. Given the fact that you are politicised and an activist, is the book a morality tale? I’m not going to pretend to be the next George Orwell, the moral of my story is not so complex. I think that most people at some point throughout their childhood would have experienced an upheaval of habitat whereby they might move house, school, town or even country and this story relates to that process and all the emotions felt with it. I know that you found the process of publishing the book difficult. Would you care to comment further? Difficult is an adjective I’d use to put it mildly! In my last article about ‘change’ I described my experience of writing and publishing a book as: ‘A goal I had envisaged which would be achieved through a creative, artistic and wholly joyful experience; that is not what the minefield of publishing pitfalls presented. It was a stress-ridden nightmare which accounted for many nights of lost sleep which meant that when everything eventually came together, the sense of achievement was absent. I felt nothing but slight relief.’ I would stick by this statement but add that I don’t regret doing it as despite feeling slightly discontent at the end of it; I think I’d feel worse if I did nothing I deemed as being worthwhile. You said in your article last month that “… an internal revolution is gathering momentum on the back of my latest achievement”, that is, your book. It sounds like you are going through a process of change as a result of this experience. Can you share with us what you have learned from it? In a strange way the recognition of the problem in itself has allowed me to stabilize and accept that perhaps this anti-climax is just a fact of life- or at any rate a fact of my life. I could become the next British female Prime Minister or win a Nobel Peace Prize but it still might not change that something isn’t right. It still wouldn’t change that it felt all wrong. I have identified that achievement often feels empty for me, but what to do about it is yet to be realised. I want to focus on developing my heart instead of my mind but it’s easier said than done; old dog, new tricks etc. I want to cut-down the social media addiction, I wish there was some sort of patch or gum I could use. I thought about giving it up for lent but I rely on it so much, now even more so for the promotion of my book. I know something has to change because for me the hope of true fulfilment brings meaning to my life but my quest for it is like chasing rainbows. The theme of the magazine this month is creativity. Can you tell me what being creative means for you? Being creative for me means producing, building or expressing something unique that is driven by pure imagination and ingenuity. Last month, with your help, we had an article about women’s cycling. It made me wonder if you are also sporty and what you think about the comment about many women’s sports failing to attract women followers and this results in men championing women’s sport? I’m not particularly into cycling but I saw the new all-female Wiggle Honda team as a huge leap forward for reinvestment in women’s sport generally. I’m more interested in skiing which similarly attracts less of a female following overall, which in my opinion is simply because men often (but not always) have more competitive and addictive personalities and so sport because it is also competitive and addictive to do and follow, becomes more male-oriented. However, the issue I have is that despite the majority of sports generally having a higher male to female ratio of followers, it’s often primarily women which fund the brands who pay their male athletes higher than their female equivalents. Advertising campaigns using female sportswomen bring in higher revenues than those with male sportsmen but 9 times out of 10 the sportsman will be paid more. My crazy nana gave me a couple of ideas for a next book including a particularly interesting one about an invisible tortoise that people keep tripping over. Either that or I might become a Hare Krishna. They always seem so content and cheerful. Although it’s a ‘kids book’ I think the message comes over well, as someone that’s moved a whole lot in their life, I think it’s important for kids to learn that change can be a good thing, even if it’s scary at first. At least now you have the experience of your first book the second will be much easier to organise! You should certainly draw from your life experience & find other stories to tell too! Cutting down on Social Media isn’t a bad idea, plus if you do then you have more time to do things worth posting!